Allergy tests are used to find out what substances cause an allergic reaction. Your eczema can affected by any substance. Anything can be an irritant or an allergen. Sometimes it is obvious what has caused the reaction. Sometimes it isn’t. This is when allergy testing can help. If you have contact with something and get an immediate reaction it is easy to work out what it is that you are allergic to. As you probably know it is often not the case. For example, your skin may become inflamed sometime after the initial contact. You may assume it was something you had recent contact with. You avoid that substance, but your skin still flares up. It could be something completely different causing the problem. If you are sensitive to a number of things, it can start getting overwhelming. Where do you start? 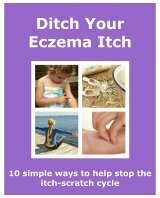 I don’t think that anyone with eczema has just one irritant or allergen that makes the condition worse. It may show a pattern that enables you to work out what is causing the problem. Another way is to consider allergy tests. They may be able to help diagnosis what allergies you have. They can then offer you help and advice on how to avoid them. Some doctors may refer you to an allergy clinic. Especially if they are unable to help figure out the causes. It is here that a test would be done. A skin prick test is normally the first choice in allergy tests, and the test most used. It is painless and safe. All ages can be tested this way. It is safe for children aged four months and over and the results are available within 15-20 minutes. It is carried out by putting a drop of a suspected allergen onto the skin. It is usual to use the skin on the forearm. Though it is sometimes done on the back too. The back is used when eczema is severe on the arm, or when done on a young child, so they cant see what is happening. A small needle then makes a small scratch in the skin through the substance being tested. This allows a small amount of the liquid to enter the skin. Up to 25 allergens can be tested in one go. Where they are placed they are labelled with pen. This shows which one is which. If there is a reaction the skin becomes itchy and red. Also a wheal will appear. A wheal is a raised area of skin, white in colour. It tends to look like the reaction you get when stung by a nettle. The reaction happens quickly. The wheal will be around 5mm-10mm in diameter. The symptoms tend to die down within a hour. Before the main skin prick test is done, a couple of control tests are done. A drop of histamine and a drop of saline solution are used. The histamine is a positive control. Everyone should react to it. If someone doesn’t it could mean that they are taking medication that blocks the histamine. These medicines could affect the test, with some allergens not showing a reaction. You will be advised not to take certain medications and antihistamines for some days before the test. The saline is a negative control. No one should react to it. If someone does it means that there skin is very sensitive. This could make any results invalid. The results from the main test can tell you what you have an allergic reaction to. It cant tell you how bad the reaction will be. So avoidance of the allergen or irritant is the best answer. Is also known as blood allergy tests. Blood is normally taken from the arm. It is examined to measure the amount of Ige antibodies it contains. These are the antibodies that the immune system releases when it perceives something as a threat, like an allergen. There are specific IgE for each allergen. So if someone has more a certain IgE, they are more likely to get a reaction to the substance that that IgE is for. There are around 400 potential allergens that can be tested for. You may have to wait a few weeks for the results. They usually bulk test blood as it makes it cheaper. So it could mean waiting till they have enough samples to make it worthwhile. This test is used when a reaction to a trigger happens over time. It is not immediate. It is done over 3 sessions, over 5 days. You first have a talk with a specialist about your suspicions and medical history. From this a list of suspected irritants can be made. A sample of each allergen or irritant is put on a metal disc. The disc is taped down on the person's back. These are the patches. They are around 2cm in diameter. You may take your own samples of anything that you suspect may cause a reaction. For example, a hand cream you use. It helps to take it in it's original packaging, as the ingredients are listed on it. At the end of the first session up to 40 discs could be taped on. They are kept on the back for 2 days. Over this time the back must be kept dry. It is also an idea to get someone to check that the tape stays stuck down. This is check that they don’t move. It is also advised that vigorous exercise is avoided for these days. The movement could dislodge a disc, or if you sweat you may get them wet. After the first 2 days the patches are removed. After another 24 hours you make another visit. Any reaction should now be visible. It will now be known what some the things are that are a problem, and which ones aren’t. The three allergy tests mentioned above are done by professionals. There are tests available online and in shops, known as commercial tests. There has been alot in the news about how effective these type of allergy tests are. The outcome has been that they aren’t effective, especially when used on children. Some of the tests will ask for a sample of hair or urine to be sent to them in the post. This type of practice has no minimum standards to adhere to, so are usually of poor quality. The best advice is to visit your doctor before doing any test yourself. They will recommend the next course of action. It is important to remember that just avoiding a proven allergen is not enough in the treatment of eczema. The skin still needs to be looked after. Regular use of moisturizers is still, as ever, so important. It is also important to realise that a reaction to something new could happen at any time. So constant vigilance maybe needed to spot any new problem allergens or irritants.